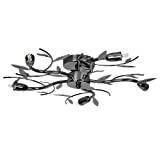 Modern 5 way ceiling light in a black chrome finish. Decorative ‘blossom’ leaves to give a beautiful look. Ceiling lights are usually the main source of illuminating a room but with the many styles on offer today, also become a main focal point or talking point. The right fitting can make a real style statement and complete your living space look.